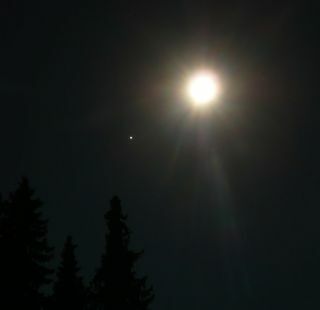 Skywatcher Daniel Fischer took this photo of the full Harvest moon and Jupiter with a handheld digital camera on Sept. 22, 2010 from Königswinter, Germany. Jupiter, Uranus (too dim to see here) and the moon were lined up in a rare conjunction. Abright Harvest Moon ushered in the changing seasons onEarth late Wednesday (Sept. 22) in a rare cosmic arrangement that hasnotoccurred in nearly 20 years. Thefullmoon of September arrived on the samenight as the autumnal equinox, which occurred last night at 11:09 p.m.EDT(0309 GMT Sept. 23) to mark the official start of the fallseason inthe Northern Hemisphere, as well as spring in the south. Notsince Sept. 23, 1991 has a full moon occurred on thesame night as the fallequinox,and it won't happen again until 2029, wrote astronomerTony Phillips in a NASA announcement. Accordingto Phillips, the Harvest Moon typically occursa few days or weeks before or after the fall equinox. This year,though, thefull moon occurs just six hours after the equinox, making it whatPhillipscalled a "Super Harvest Moon." Amateurastronomers around the world took advantage ofclear skies to gaze at the bright full moon. "Justso beautiful," wrote skywatcher RuthBurkhead, who snapped a photoof the moon and Jupiterfrom her backyardin Eustis, Fla.
TheSeptember full moon also coincided with an alignmentof Jupiter and Uranus, adding extra flavor to this year'sfall equinox. InK?nigswinter, Germany, skywatched DanielFischer said he couldn't let the moment pass without a photo. Anequinox is a time in which the sun is directly aboveEarth's equator, when the day and night are roughly the same length.There aretwo equinoxes each year, one in the fall and one in the spring. Everyfull moon has a different name, one which variesdepending on different cultures. TheHarvest Moon gets its name from agriculture, Phillipsexplained. "In the days before electric lights, farmers depended on brightmoonlightto extend the workday beyond sunset," Phillips wrote. "It was theonly way they could gather their ripening crops in time for market."